Support for a Kerberos based Network Authentication Service and the introduction of Enterprise Identity Mapping (EIM) were exciting OS/400® V5R2 announcements during 2002. A Kerberos based Network Authentication Service enables the iSeries (and any kerberized application) to use a Kerberos ticket for authentication instead of a user ID and password. This enables you to sign on once in the morning to your Kerberos based security server and not be prompted again when accessing your enabled applications. This is called Single Signon (SSO). Enterprise Identity Mapping (EIM) is a cross platform solution that involves a wide range of technologies including Kerberos, LDAP, and Kerberos Network Authentication Service. Basically, EIM is a framework provided by IBM that allows the mapping of authenticated users to OS/400 (and application) userids. This extends the power of SSO to the enterprise. 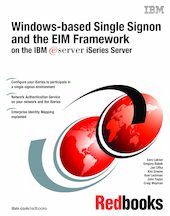 Because the iSeries is well known as a server that can consolidate a wide range of application programming environments into one manageable system, this IBM Redbooks publication, then, studies the implementation of Kerberos and EIM in a SCON environment that includes OS/400, Windows, and applications that are right now being updated to support the new framework. We provide easy to follow examples that demonstrate all the pieces working together.